Don't forget to print out the maps you will need for your trip... simply download the pdf below and print from it (especially the close up map). 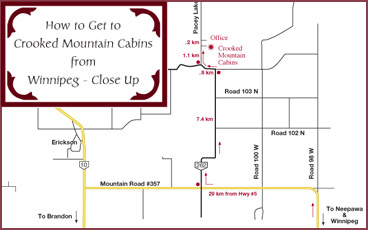 This map shows how to get to us from Winnipeg. Click map to see a larger version. 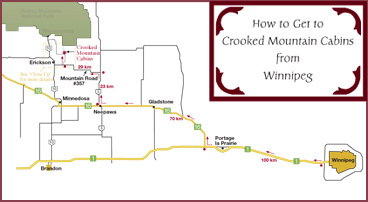 This map provides more detailed directions from Winnipeg in the area right around Crooked Mountain Cabins. Click map to see a larger version. 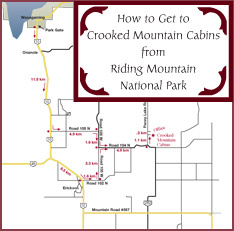 If you are coming to Crooked Mountain Cabins from RMNP, this map will be useful. Click map to see a larger version. © 2013 Crooked Mountain Cabins. All rights reserved.